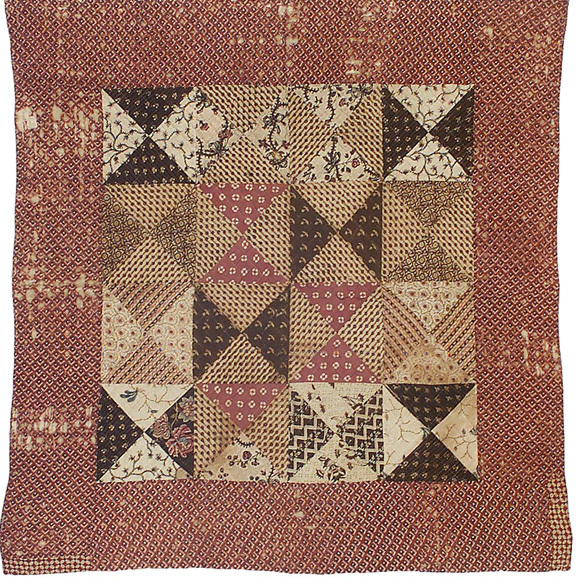 1820, among the earliest of American styles. Comparing this undated Pincushion or Orange Peel quilt from the Dillow Collection to dated quilts gives us an estimated date. 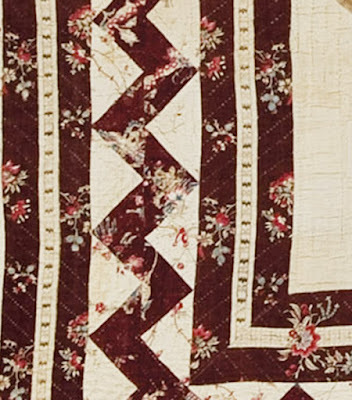 The date range begs the question concerning early quilts. 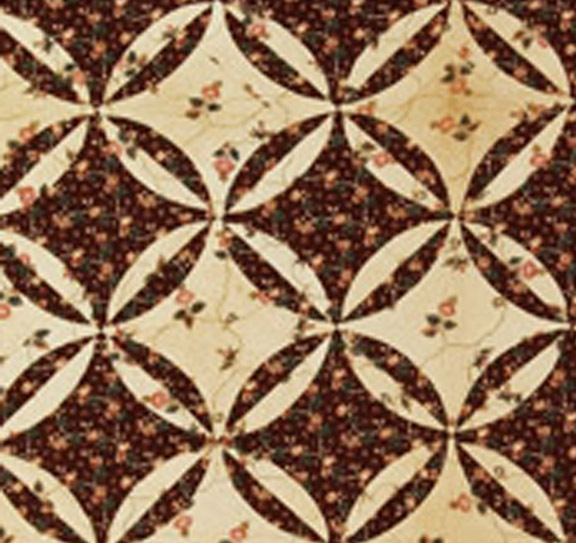 Why did the style develop in the 1780s? And another: Why are there so few American patchwork cotton quilts before that time? I recently re-read book The Growth of the British Cotton Trade 1780-1815 by Michael M. Edwards looking for answers. The basic answer seems to be that the cottons that dictated patchwork style were unavailable before that date. 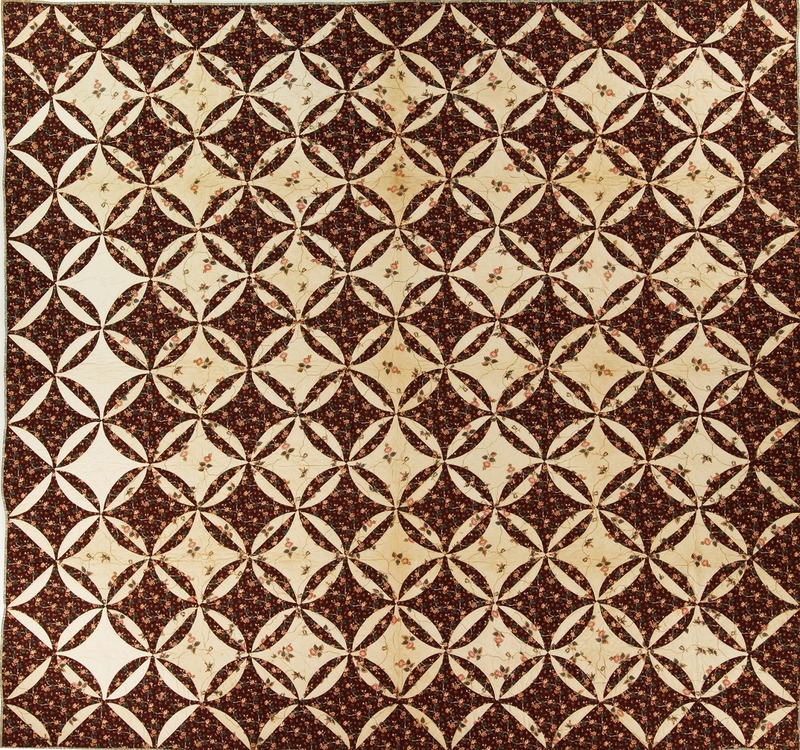 Cottons from India and China had been printed for centuries and imported to Europe as luxury goods, but American patchwork style and the British printing industry are closely linked. 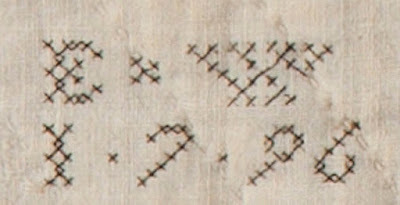 Date inscribed 1796. MESDA Collection. 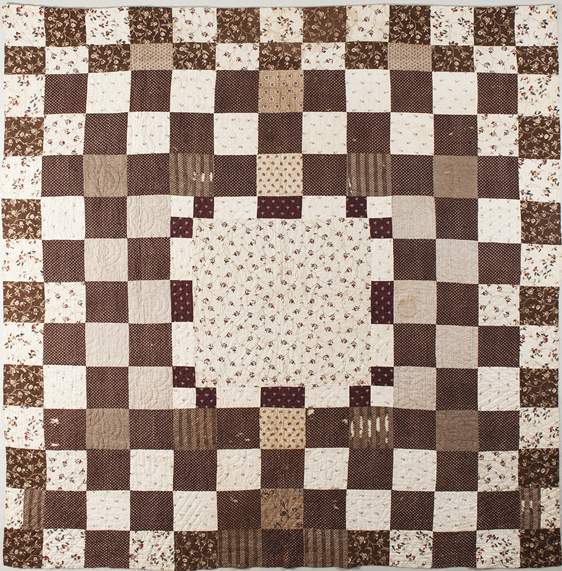 Why no cotton quilts here before 1780? Because cotton fabric was not available. We can look at trade, technology and taste for reasons. Trade is always important as textiles have long been a basis of international economies. 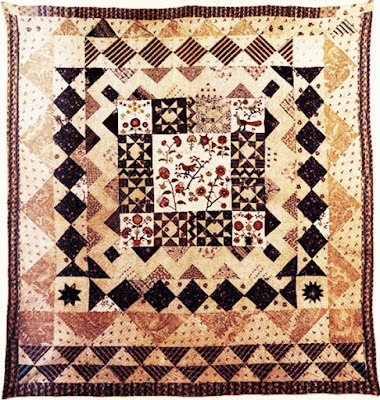 Revolution in North America meant no English imports until after the peace in 1783, but even had ships been sailing from England to New England there would not have been much British cotton to carry. the last thirty years of the 18th century. 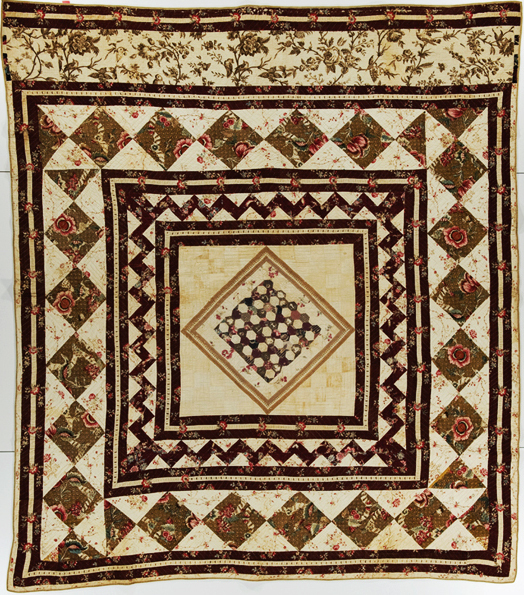 Cotton is difficult to spin by hand or with early mechanized machinery. 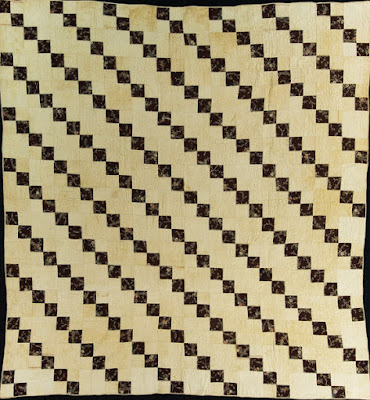 Eighteenth-century cotton yarns were better for weft than warp, which is why so much mixed fabric of linen and cottons (fustian) was produced. Medallion quilt, collection of Connor Prairie Museum. There were bottlenecks at every step of cotton production from field to cleaning and carding, spinning yarns and weaving cloth. 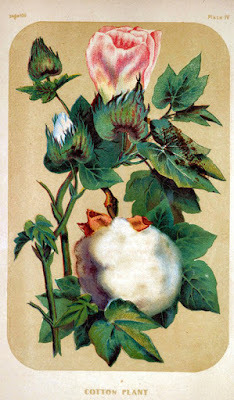 And the raw cotton was hard to obtain; it’s a fussy plant with soil and climate determining quality. 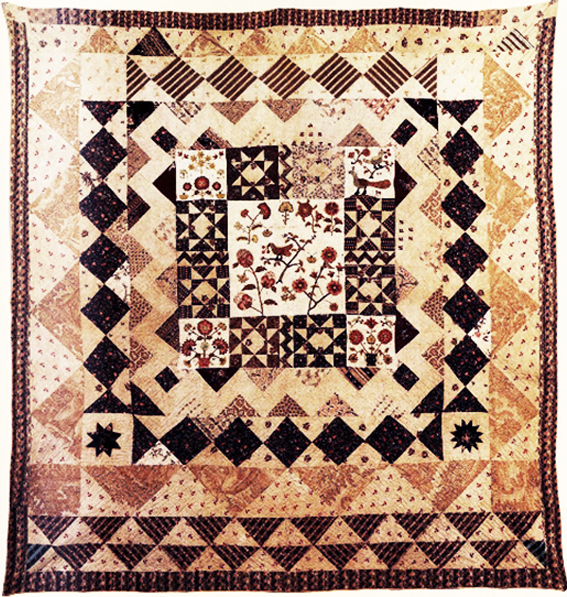 Late-18th-century technological changes included new plant varieties from the Americas producing better yarns. 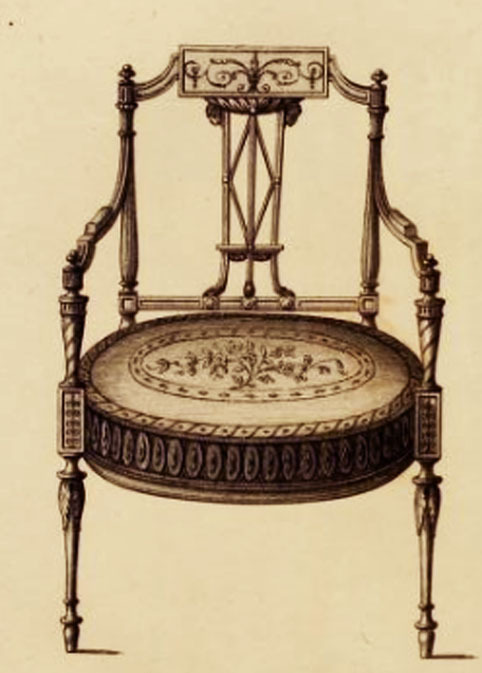 British mechanization improved and patents expired, encouraging competition and further progress. 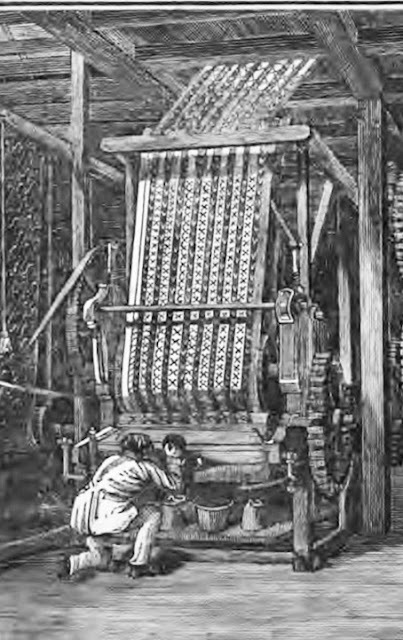 Weavers became more skillful and more productive, working under new and efficient organizational structures. And textile engineers experimented with engraved rollers suited to cheaper cotton calicoes. Technological changes resulted in plentiful goods resulting in changing taste. 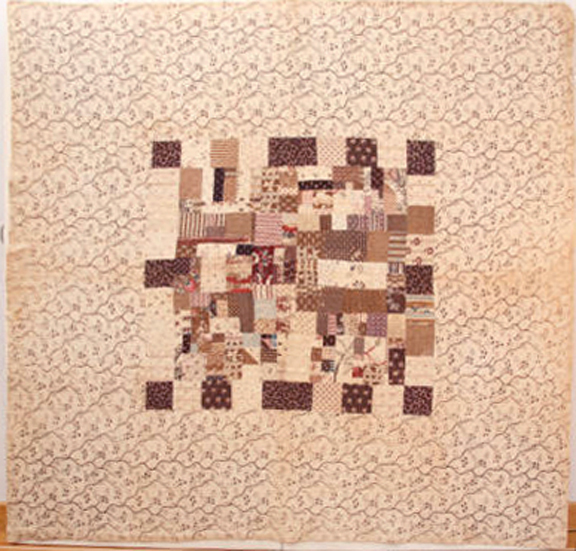 Women's gowns became simpler, suitable for lighter cotton rather than silk, wool and linen. 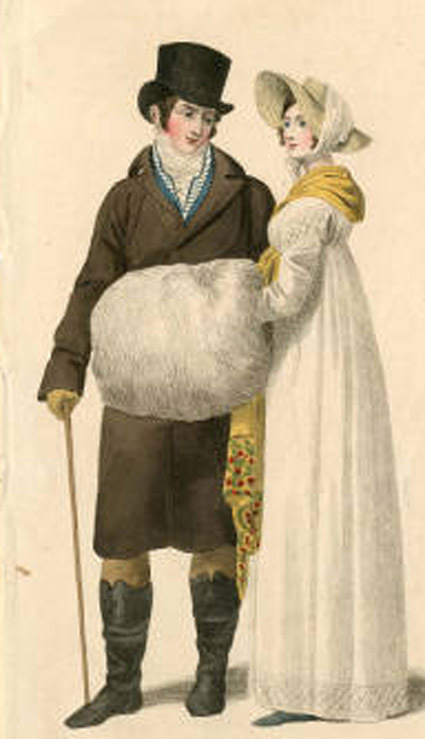 Cheaper fabric for the gown meant more money for accessories, such as cashmere shawls and fur tippets. 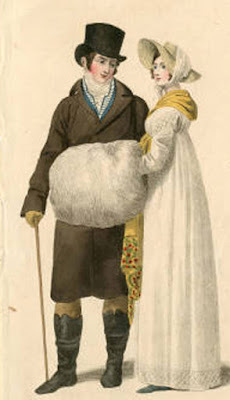 Cotton was easily laundered resulting in an emphasis on personal hygiene, the Beau Brummell look of starched, clean garments. 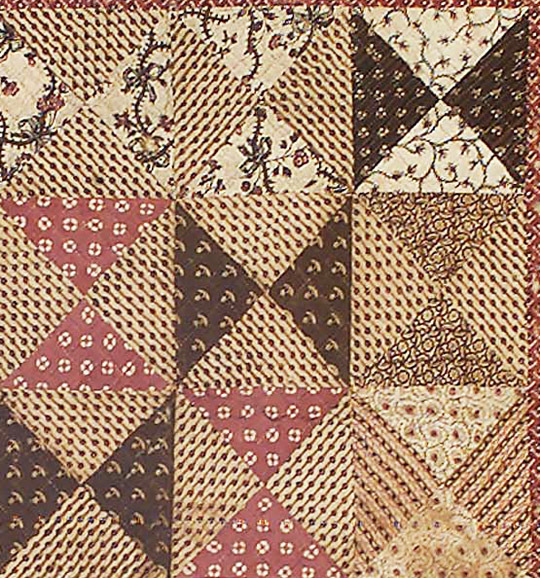 And inexpensive fabrics meant a more egalitarian look across the classes. 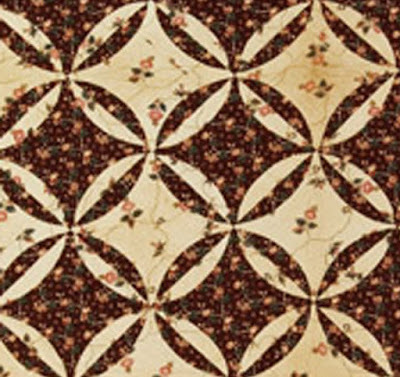 Decorating fashion also adapted to the novel styles with furniture prints for "calico table cloths, doyles [we spell it doilies], curtains, chair covers, bed hangings & sheetings” and, of course, patchwork bedcovers. 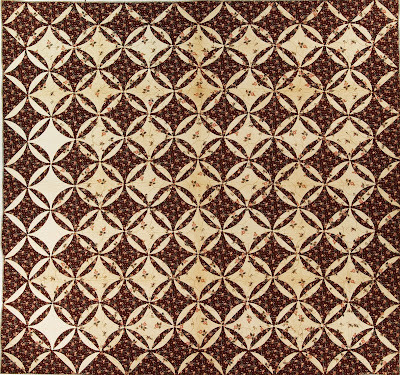 Furniture softened with printed cottons changed the look of rooms once dominated by dark and heavy wooden pieces. Taste demanded variety and value. 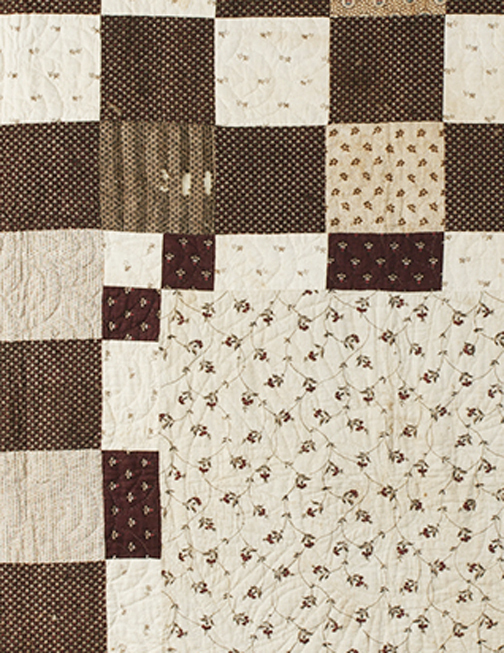 Printers, shippers, merchants and cotton growers made fortunes in supplying the demand. 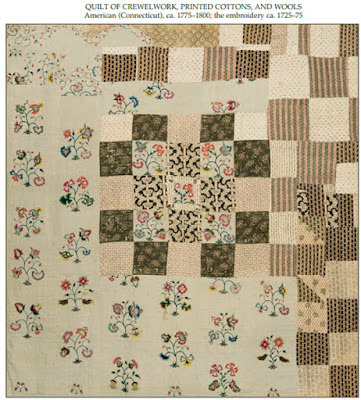 So I can give up looking for American cotton patchwork before the last quarter of the 18th century and change my mind about pieces like the two below. and patchwork from the late century. 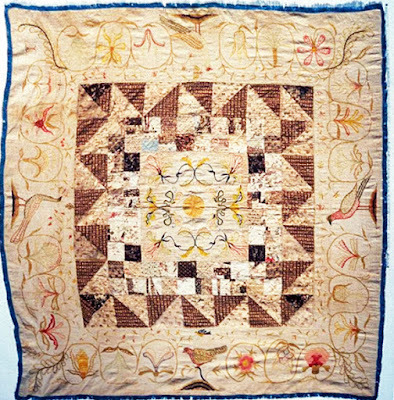 Once I would have looked at the patchwork and the embroidery as being from the same time frame and considered a mid-18th-century date, but this is a case of someone incorporating an older embroidered piece into a later bedcover. 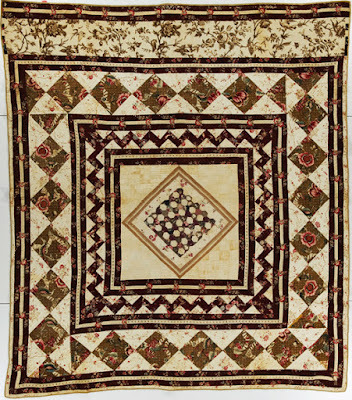 And that's the end of the posts on high-contrast quilts and dark-ground chintzes---I'm impressed with the style's popularity and how many survivors are in public collections. Just imagine how many did not survive. It must have been a real craze. Kerry, I of course think it's fascinating so I'm glad you were interested. Love the browns. I've been thinking of making an orange peel quilt but in blue -- of course! I wonder from this if you can extrapolate that lindsey woolsey was made for the same reason?